"The Instant Pot is a pressure cooker, a slow cooker, a rice cooker and a yogurt maker that can saute, steam, brown, and warm." "Comes with a built-in Alexa system and can wirelessly stream music from nearly every platform, including Spotify, Apple Music, and Pandora." "Each print is custom made to look like your favorite couple and is printed on thick cotton blend canvas." "Made from 100% washable, virgin wool, this blanket comes in twin, full/queen and king...choose between five different colors." "Features each couple’s name and significant years of their relationship—both the year they met and the year they become a married couple." "Features the couple’s name and their address, and is available in sizes ranging from ¾” by 2” to 2” by 3 ¾”." "With over 120 recipes, this cookbook is perfect for a weekly date night in." "Features three super scratch-resistant polycarbonate spinning suitcases perfect for any vacation." "This monthly box features between four and five delicious artisanal products like hot sauce, pickles or cocktail mixers." A newly engaged couple probably has a lot on their minds. Not only are they busy celebrating their news and responding to endless “OMG!” texts, but they also have a wedding to plan, too. That’s why we love the Instant Pot DUO60 as an engagement gift. This incredibly useful 7-in-1 kitchen gadget is the perfect tool to keep a busy couple fed, even when it feels like there’s simply not enough time to cook dinner. 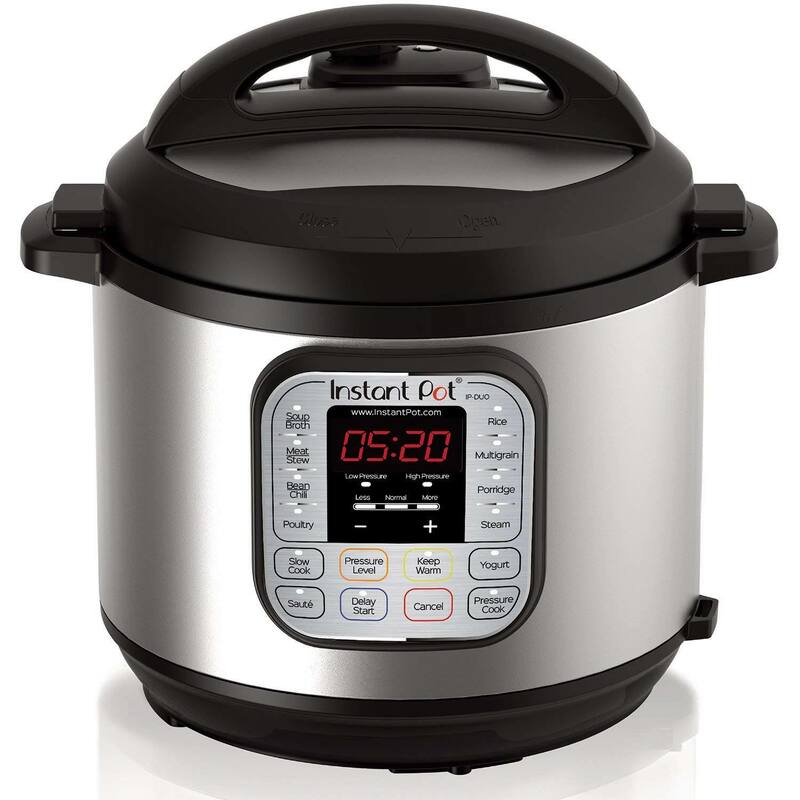 The Instant Pot is a pressure cooker, a slow cooker, a rice cooker and a yogurt maker that can saute, steam, brown, and warm. It can speed up cooking by up to six times and uses 70% less energy than other cooking methods. The device has 14 built-in settings, can be set to cook up to 24 hours in advance and features three temperature settings. It also comes in three, six or nine-quart sizes. If you can name it, you can probably cook it in the Instant Pot, and we’re sure the couple in your life will love this gift during their busy wedding planning time. Planning a wedding is stressful, but a long day of writing out invitations can be a lot more fun with the right soundtrack. The Sonos PLAY 1 is our pick for best wireless speaker. This smart speaker comes with a built-in Alexa system and can wirelessly stream music from nearly every platform, including Spotify, Apple Music, and Pandora. Using any home wi-fi system, the Sonos PLAY 1 can be operated either by voice via Alexa or through an app on your phone or computer. It features Class-D amplifiers to produce rich sound in any room. This speaker can function alone or connected to a larger house-wide Sonos speaker system. Reviewers say that while the Sonos PLAY 1 may not provide concert-level acoustics, it provides surprisingly robust sound for a wireless speaker. The Alexa feature makes this Sonos Bluetooth speaker an incredibly useful addition to any room. A newly engaged couple has a lot to look forward to: a wedding, a honeymoon, and most importantly a future together. This custom portrait from Etsy seller Printable Wisdom is a poignant way to help celebrate the couple’s next step together. Each print is custom made to look like your favorite couple (and can even include their furry family members too!) and is printed on thick cotton blend canvas. A banner with handwritten calligraphy is displayed under the couple’s picture and celebrates their union and new life together. The portrait comes in seven sizes ranging from 5" x 7" to 18" x 24". Although practical gifts are always welcome, this custom portrait is a wonderfully meaningful gift for your favorite almost-newlywed couple. Owners say the print came quickly and was vibrant and high quality in person. Now is a time to shower your friends or family with luxury gifts they may not buy themselves, and this Pendleton Wool Blanket from Lands’ End is the perfect cozy gift to show your love. Made from 100% washable, virgin wool, this blanket comes in twin, full/queen and king, and is wonderfully warm. Each size measures 96” long and you can choose between five different colors. For an extra special gift, buy one for him and one for her and have each monogrammed with couple’s initials. A wool blanket is a gift that will never go out of style and a piece that will last for years to come. Owners say the Pendleton blanket is soft, easy to clean and incredibly warm. A marriage is where two individual stories meet and become one, so what better way to celebrate this upcoming union than with this Intersection of Love Art Print? Created by artist Patricia Carlin, the print features each couple’s name and significant years of their relationship—both the year they met and the year they become a married couple. It comes in either full color or black and white, and framed or unframed. The print alone runs 11” x 14" and is printed on matte paper using archival pigment ink. Because it’s a made-to-order item, purchase it at least two weeks in advance to ensure you receive it on time. Reviewers say this print is a unique gift for any couple, stating that it was incredibly well-received and instantly beloved. If you are searching for a touching, custom art print for the modern couple, this is a great choice. Both practical and thoughtful, the Ink Me This Customer Rubber Stamp is a wonderful way to celebrate a couple’s big news and help them address all those endless thank-you notes. This rubber stamp features the couple’s name (either their soon-to-be-shared last name or both of their first names) and their address, and is available in sizes ranging from ¾” by 2” to 2” by 3 ¾”. The stamp is pre-filled with oil-based indelible ink (no pad needed) and can be refilled as necessary. Etsy reviewers say the Ink Me This stamp is high quality and easy to use. After hours of addressing envelopes, the happy couple will definitely appreciate this shortcut—an aesthetically pleasing one at that. A cookbook is a great gift for a newly engaged couple that needs a reminder to keep the spark alive by sharing a meal together as often as possible. We love Date Night In by Ashley Rodriguez because it’s filled with romantic recipes for delicious dinners for two. With over 120 recipes, this cookbook is perfect for a weekly date night in, and features recipes like fennel-crusted lamb chops and rhubarb sour cocktails. Whether life is too busy to go out or the couple is saving extra money for the big day, this cookbook is a great way to help bring a little romance into their lives without leaving the house. Sure, the wedding is the main event—but the honeymoon is the cherry on top. What better way to get your favorite couple stoked about their upcoming trip than with a brand new luggage set? The Samsonite Omni 3-Piece Spinner Luggage Set features three super scratch-resistant polycarbonate spinning suitcases perfect for any vacation. This set comes with a 20”, 24” and 28” suitcase and is available in six different solid colors. All three are extremely lightweight, ranging from under seven pounds to just over 10. The push button handle and 360-degree spinning wheels allow for painless travel, even when dashing through security lines. As a durable and easy to maneuver suitcase set, this is a gift every engaged couple will use for years to come. Everyone loves food gifts, and the Mouth Best of the Month subscription is the food gift that keeps on giving. This monthly box features between four and five delicious artisanal products like hot sauce, pickles or cocktail mixers. 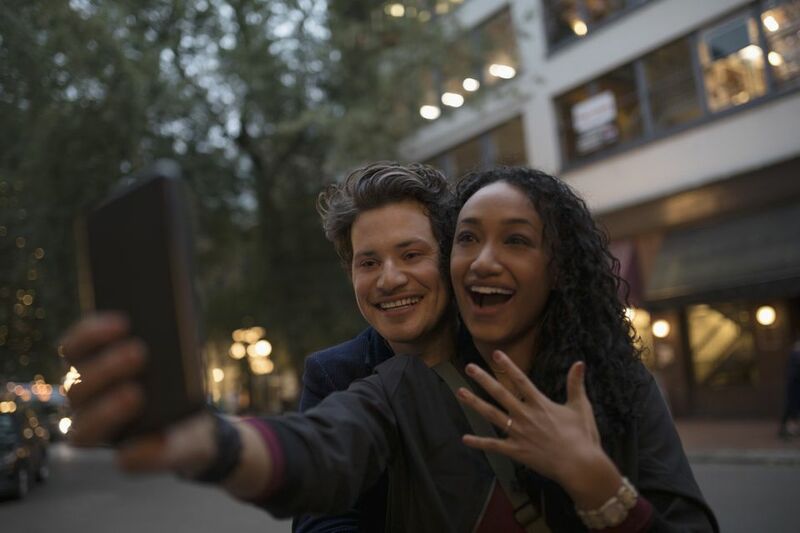 You can gift either three, six or 12 months of delicious surprises and the couple will receive a welcome certificate informing them of their upcoming subscription. This is the perfect gift for the foodie couple who loves trying new things. Because each month will feature a new handful of surprises, it’s best for those without food allergies. Instead of giving the happy couple a gift basket to celebrate their news, you can give them a gift box of surprises every month until their wedding.